An inspection of the trees on the property revealed that one was being eaten by termites, another had a large hole in the base and a couple more were in the wrong position or just too ugly to survive. Time to call in the tree guys. Last year we had eight trees taken out and it really opened up the yard. 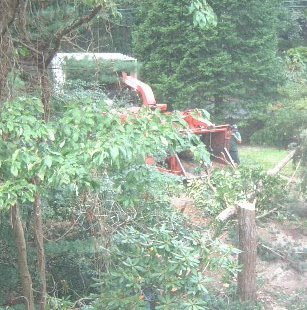 This year we decided to take out eight, prune a bunch more and clear out the north side of the property that had been used as a giant dump over the years. As usual it takes a whole day and is as noisy and dusty as you can imagine but we also had a couple of "whoops" moments to contend with. They managed to let a large segment of white pine trunk fall on a 10' rhododendron; goodbye rhodie. More seriously a branch of the linden tree they were pruning caught the gutter on it's way down and bent it into an unusual shape, rendering it useless against the heavy rains that hit us last week. C'est la vie. It's over and the yard is cleared again. I'm just glad it wasn't the power-lines they took out.